Dad farmed with horses (Lady and Tony) until he sold Tony to buy a tractor and a steel wagon. Dad had been picking corn by hand all day. He would get one load in the AM and a second in the PM. The horses would move down the picked rows moving forward and stopping at his voice commands while he picked two new rows. He used a corn husker (a leather strap that wrapped around his cotton “farmers” glove with a steel hook) on his left hand to rip the husk away from the ear and then he would grab the base (ear stem) with his right hand and separate the ear with away from the stem with his left hand. Then he would make a left handed side arm toss into the wagon. The wagon was a wooden box on big wooden spoke wheels like the wagons you see in the movies used for wagon trains (Conestoga). It also had a side board on the left side made of two 1 x 12’s edge to edge to form a 24 inch “bang board” to bounce the corn into the wagon. That was a simple removable “bang board” used during corn picking in that the slats that nailed to the boards holding them together extended to drop over the side of the wagon. When he got to the end of a row Dad would swing the team to the right several rows and start back always tossing the ears of corn to the left. Sometimes there would be two corn pickers and they would each pick 2 rows. The one on the farthest rows needed to be careful not to hit the guy on the inside rows with the ear of corn he threw into the wagon. This wagon was used for many different things. In the spring a spreader was attached to the back “end gate” for planting oats and wheat. A chain and sprocket located on the back wheel of the wagon drove the two small horizontal fans of the spreader. It was necessary for some one to drive the team (later tractor) and some one to be in the wagon to add seed to the hopper. It was my job to keep the hopper full of seed as I bounced around inside the wagon. Well it was late in the PM one fall afternoon when Dad came into the farm yard to unload the corn picked that afternoon into the corn crib. He had an elevator, powered by a single piston engine with a big fly wheel and long flat belt. There was also a hoist to pick the front of the wagon so most of the corn would fall out the back of the wagon into the elevator feeder. The wagon had the big wooden spoke wheels and was an all wood box like the wagon train wagons in the movies. Lady was a gentle horse but Tony was always a problem. There was a thunderstorm starting and it was cloudy and the wind was gusting blowing dust and it was late so almost dark. The elevator dropped the empty wagon box the last few inches and that was the final straw for Tony. He took off, dragging Lady, around the farm yard in a big loop swinging the wagon behind. Then the wagon tipped over and soon all the horses were pulling were the two front wheels. The next day Dad sold Tony and bought his first tractor, however, Tony didn't go easy. Dad got him into the barn to get ready for the truck. The barn door was actually two separate hinged doors, upper and lower. In this case the upper door was open. I was out side the barn watching when I suddenly saw Tony come through the open upper half of the door destroying the lower half with his hind legs. After that dad sent me to the house so I don't know how he finally caught and shipped Tony. This is the barn. The bottom door was closed and Tony tried to jump through the top open door. Well, he totaly destroyed the bottom door in the process. The country school that I went to was district 21. It included the first 8 grades with one teacher. There were anywhere from 10 to 15 students all in the same one room school house with one teacher. However, they usual tried to group the ages to avoid only one child in a grade. I was held back a year to join two other boys just starting. Even so, we were still about the same ages as Mom had started me young. 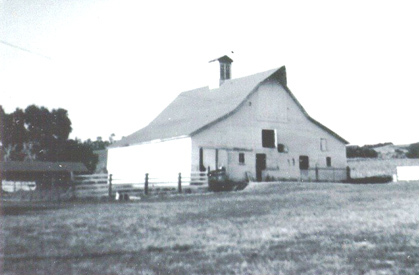 The school was located on the corner of a field and across the road from a farm house. Otherwise we were all alone out in the country four or five miles from town. There was a hand pump to a well outside for water and also separate outside toilets for girls and boys. I attended this school through the fourth grade. That was when my sister Patricia (Patty – Pat) graduated from the eighth grade and Mom had to start driving us to the Catholic School in Norfolk. During those four years, Mom would usually drive us to school but on nice days we would walk. Walking home involved covering the gravel road to the highway and they along the highway to our country road then onto the lane to our house. There was a rail road track that ran parallel to the highway. All of this together was about 2 miles. Most of it could be seen from our house so Mom could see us trudging home. Some other children would walk part way with us. The Nicodemus family lived past us and their father usually came to get them. Some times we would ride with them. They had an old car that never seemed to go very fast. I think the transmission was stuck in a low gear. It was mostly open as the windows didn’t roll up and as a result it was dirty from the dust and rain collecting inside. They had three children older than me. On these walks home along the highway, which is the road that runs from Norfolk to Stanton, I first started to notice an interesting phenomena. The stretch of road we walked down was straight for about 4 miles. Walking home we were about in the middle of this stretch so we could look both ways for a distance of 2 miles. In those days (1947 – 1951) there wasn’t much traffic. During the time we walked along the road (about half an hour for a mile) we didn’t see more than four or five cars in each direction. But, the interesting part was that those cars, going opposite directions, often would pass at exactly where I was walking. I noticed this as a young child because it seemed so odd. I could look down one direction of the road and see a small dot of a car two miles away and then look the other direction and see another dot coming toward me the opposite way and they would pass each otherwhere I was standing. I have continued to notice this over the years, particularly when I was running and biking. It seems that the statistical odds of this triage occurring so often make it unusual. One afternoon at school in the fall we could hear some one hollering from the direction of the farm across the road from our school house. The teacher sent some of the older boys to see what was wrong. They found the farmer caught in his corn picker. It was a pull behind picker that was driven with the power take off. Those single row pickers were always getting plugged up with corn stalks and in this case he had gotten off the tractor with the PTO running. That meant the conveyor chain feeding the picker was running. When he tried to clear the stalks one of the conveyor chain arms caught his glove and pulled his hand into the moving parts. One of the boys turned off the tractor and they got him back to his farm house where someone took him to the doctor. Eventually we found out the he had lost some fingers on that hand. This was the transition between horses and tractors. The farm machinery was being converted and modified to adapt to the tractor but where it may have been safe with horses it was very dangerous with a tractor.